Honorable Mentions: Chicago, Indianapolis, Philadelphia, Salt Lake, and Seattle. This entry was posted on Tuesday, May 29th, 2007 at 3:55 am	and is filed under Dogs, National Dog, Cat & Pet Info, Products & Services for Cats & Dogs, Misc. Pet Info., Dog Parks & Travel. You can follow any responses to this entry through the RSS 2.0 feed. Both comments and pings are currently closed. The outer Banks is quite Dog friendly. We rented a large home through Hatteras Realty where they have lot of dog friendly homes. The beaches there also permit leashed dogs all year. Most other beaches on the Atlantic side don’t. My dogs, an Aussie and a Bassett really enjoyed themselves as they had never seen the ocean before. We don’t go anywhere without our dogs so this was great for us. Our dogs have traveled with us everywhere and found most states to be quite dog friendly. If you really want the ultimate doggie vacation (human and dog/dogs), there is nothing as fun as or stess releaving as dog camp! 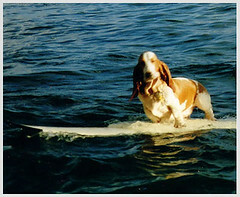 DogFriendly.comâ„¢ publishes U.S. and Canadian pet travel guides for dogs of ALL sizes & breeds. Listings for over 25,000 hotels, B&Bs, ski resorts, campgrounds, and beaches that are pet-friendly.